This is hands down my favorite "cheap" palette. BH Cosmetics isn't the creamiest most pigmented formula out there by any means. But when you compair it to brands with similar pricing (Covergirl, Maybelline, Wet and Wild, ELF, NYX) it's quality is unparalleled. And honestly it's even less expensive than most of those brands. It's not quite professional, but it's close. I actually use the Carli Bybel palette in my pro kit. The pigment isn't mind blowing, but it's great. And honestly it's mind blowing for such an inexpensive palette. The shadows aren't crumbly, and have a nice texture. The packaging is very typical. It's not sturdy or fancy looking, but it does the job. 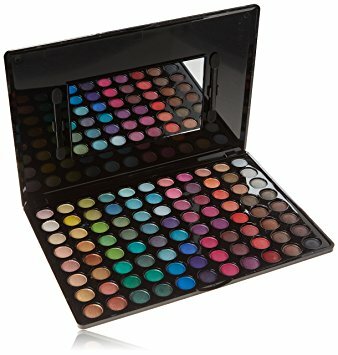 They have all kinds of shadow singles and palettes. The one pictured above is the BH Cosmetics 88 color Matte Eyeshadow Palette, which runs at $12.99. They do a lot of collabs with various instagram and youtube artists and celebrities. Some that I love are the aforementioned Carli Bybel 21 color Eyeshadow and Highlighter Palette, the Shaaanxo 18 Color Shadow Palette, and the Illuminate By Ashley Tisdale 12 Color Eye and Cheek Collection.